Photoshop is the best software used by millions of Graphic Artists and Web Designers across the globe. Photoshop is the only one of its kind that help to materialize creativity in the drawing board through images, colours, brushes, filters and various techniques and procedures. Photoshop is a user friendly easy to learn software. To master Photoshop you need a proper ‘GURU’ that you can find here at FroggyLeap. 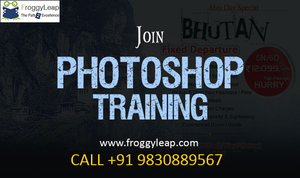 Indeed FroggyLeap is the best institute for Photoshop Training in Kolkata. Here you can get only Job based Photoshop Training. What you need to do is just Call at 9830889567 and let us knows your requirement. We will definitely guide you if you are really interested in learning Photoshop & CorelDraw. So friends, why you should learn Photoshop?